Staff Sergeant Jess Sackett Receives Purple Heart (and UofO Care Package!) | Stahancyk, Kent & Hook P.C. Stahancyk, Kent & Hook Associate Attorney Jennifer Sackett’s husband, U.S. Army Staff Sergeant Jess Sackett, is the recent recipient of one the military’s highest honors: the Purple Heart. 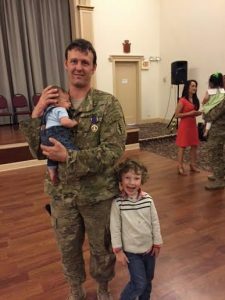 Jess returned earlier this year to Oregon from Afghanistan where he was deployed with the 19th Group Special Forces, a component of the Washington National Guard. On December 16, 2015, Jess was wounded in action and was treated for the injuries to his right arm. Thankfully, there was no damage to any nerves or vasculature. Jess received his initial treatment at the Kandahar Hospital before being sent to Landsthul, Germany to see an orthopedic surgeon who specializes in treating hands and wrists. Jess was originally awarded his Purple Heart in Kandahar, but it wasn’t until Friday, April 29, 2016, that he was given his medal at the Landmark Convention Center in Tacoma, WA. Jess was surrounded by friends and family to recognize the heroism and bravery of members of Alpha Company, 1st Battalion, 19th Special Forces Group during their recent deployment to Afghanistan in support of Operations Freedom’s Sentinel and Resolute Support. At that same time, Jess finally received a care package put together by the University of Oregon and its supporters. Though the package was first sent to Afghanistan, Jess did not receive it until several months later when he was back in the Northwest. An avid Oregon Ducks fan, Jess was also incredibly excited to find out that he had received some gifts from the University of Oregon Athletics. As for his injuries, Jess is well on his way to a full recovery. SK&H salutes Jess Sackett for his tremendous service to his country.